The Grauer Mapa is a unique humidor. Indeed, several months of design were necessary to obtain such a result. From the visual aspect to the technical characteristics and the materials used all aspects of this humidor have been carefully considered. Let's start with the visual aspect. The choice of color is typically in the style of The House of Grauer. We wanted an authentic, natural color. Thus, this shade almost "taupe" color was specially developed and then lacquered to provide a refined finish. In addition, it highlights all the metal inserts on the facade. Made of 24-carat gold, they give this work of art an elegant and lush finish. Inside, we find the best materials, made with traditional techniques to make this humidor the perfect companion for your vitolas. Thus, the massive Spanish cedar (Cedrela Odorata vintage 1983) was selected because, having undergone special treatment, it allows to maintain a perfect humidity level. In addition, it does not emit any odor and will ensure a durable and safe storage for your precious cigars. Christos Karnabakos is a Greek cigar lover and a true wood lover. He knows only too well how to create a humidor whose vocation is to preserve the Cuban cigars from the environment in order to enhance the desired flavors. 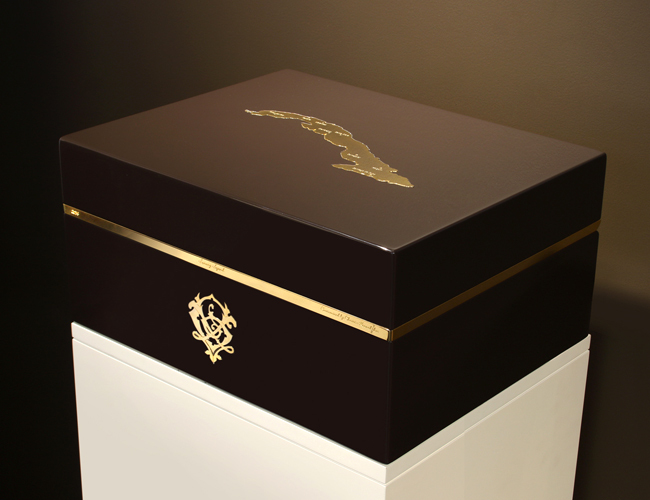 A specialist in custom-made humidor design, Christos Karnabakos combines his knowledge acquired during his 24 years of experience with the needs of even the most demanding of clients.